After my father died in early 2012, I struggled with how to honor his memory. Dad was a truly great man and I often feel at a loss to live up to his legacy. There were many things I wanted to try, but they were, well, too grand, to big. There was no way I could pull them off without serious capital, time, or talent. Fortunately, it didn’t take long before I passed the distractions of my grandiose ideas and settled on a memorial more fitting to the man he was. It occurred to me that Dad, while known for occasional grand gestures, was not best known for them. He was known for a sometimes gruff personality with little patience for nonsense, but also a million small kindnesses that betrayed his deep and unwavering regard for people. In short, Dad cared. Regardless of anything he said, he always looked for the best and genuinely wanted to help anyone who needed it. Just ask any of his students who ever struggled in his class. They know. “Are you going to another restaurant?” Dad asked. I know we would have followed her to another “favorite” restaurant. She was a really great server. It didn’t hurt that she wore her jeans well either. That’s how I arrived at a way to honor his memory. While I have always been a good tipper (I hope) based on his example, I decided I was going to kick it up a notch. Obviously, I wasn’t going to start funding college for anyone, but I had an idea, a crazy idea that I could do something small that would leave a large impact. Of course, I hadn’t considered what it would impact. In that April of 2012 I decided I would always leave a tip, no matter the service. That wasn’t good enough though. I further created a minimum amount I would tip that was not tied to the bill. This minimum would apply even if I was by myself and the meal came to eight dollars. I understood that my wild notion meant I would sometimes tip more than the restaurant charged me to eat. This still seemed a little odd, so in the beginning I tried to make it a little more palatable. 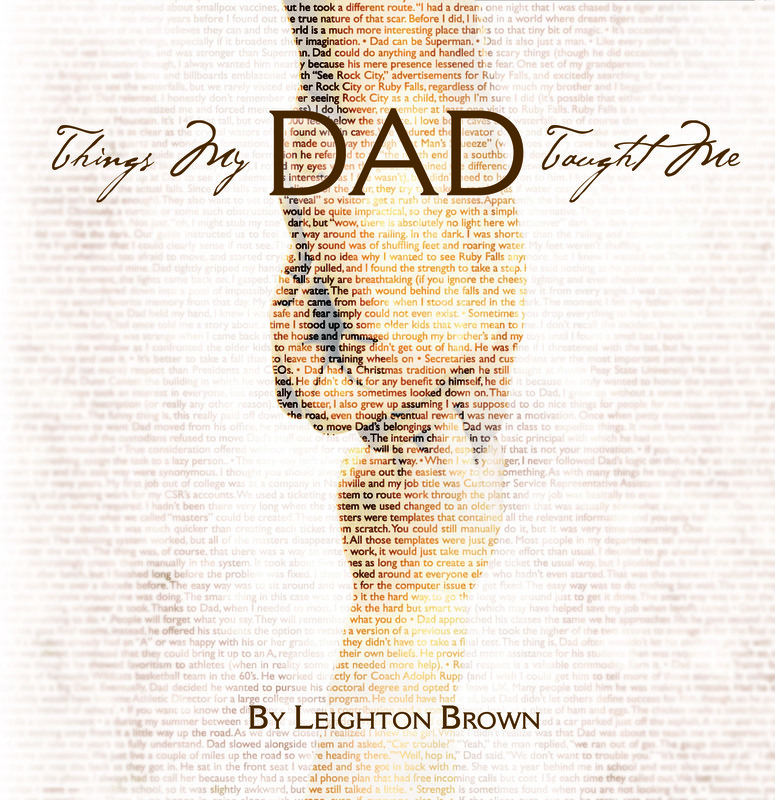 I also came up with a shameless marketing ploy to always leave a copy of the book I wrote for Dad shortly before he died. I couldn’t very well leave a book that exhorted on page 150 to “Tip Generously” and not leave a good tip could I? Armed with my shameless marketing ploy, it was quite easy in the beginning. Over time though, I started to feel a bit silly about leaving my book along with the tip. Part of it was because I was very self-conscious whenever I pulled the book out. Part of it was also that I felt I should leave something of value, and I wasn’t sure my book qualified for every server. I stuck with my minimum tip though. I refused to give up that portion, and it wasn’t long before it was second nature. For a while, the only problem I had was the occasional math olympics to figure out how to tip generously when my minimum amount wouldn’t cover fifteen percent. I felt slightly dumb once I realized that I could always figure out a “normal” tip and then simply add my minimum to it. Sometimes I overcomplicate things. That was my only problem until the first night I had really bad service. Let me explain: when I write “bad service” I don’t mean I was mildly irritated at my treatment or that my food wasn’t cooked to my exacting specifications (which wouldn’t be the server’s fault anyway). I mean we only saw our server three times. Just three times. He wasn’t even the first person we talked to, he came by after we ordered. He didn’t bring us our food. The one refill I managed to get came from another server in a different section after I fired a flare gun into her tray. That might be a slight exaggeration, but only the part about a flare gun. I really only got one refill. The second time we saw him, he came by the table and joked with us. We stared, but he kept laughing as if it was perfectly normal to be completely absent until . . .suddenly I got it. He had the bill in his hand. He was ingratiating himself to us. He left the bill and walked away, glancing back and smiling as if we were all best buds. We weren’t. “Can you believe the chutzpah of that guy?” I asked. “Hoots what?” my wife said. The third and final time we saw him was when he brought our bill back after swiping my card (which I had out when he brought the bill just in case you’re counting at home). I stared at the bill. I made a promise to my Dad’s memory to always leave my minimum tip amount. At that moment, however, it was quite difficult. Tipping is often a social contract. A server provides good service and the customer rewards that service. If the service is bad, you might leave less than normal. If the service was abysmal (as it was that night), you might leave nothing. I sat there weighing the arguments and rationalizations in my head. On the one hand, the service had been really poor. On the other hand, I promised to leave a set minimum amount whether the service was good or not. On the other other hand the service was really poor. I debated and cajoled with myself. I tried everything I could to undo this conundrum. Then, a moment of clarity where everything shifted. It tipped over. I suddenly realized the true import of my decision to memorialize my father. I hadn’t chosen to honor his memory by leaving a set tip amount, because that in and of itself was unworthy. The minimum tip was only a result of what I had really chosen: to be kind, generous, and as caring of others as he was. I also understood true kindness is given whether it is deserved or not. I knew what I must do. I filled in the tip amount with my set minimum, which in this case nearly doubled the bill. I then hastily scribbled a note on the bill. Looks like you’re having a bad night. We’ve all been there. Hope it gets better. That small act shifted the dynamic. No longer was I above someone able to dole out reward and punishment based on how well he had pleased me. No longer could I deny the times I let someone down or had a bad night of my own. I was just a regular guy trying to live up to the name left me. I was just a guy paying a bill. I thought of Dad and hoped it was enough. This entry was posted in Stories and tagged customer service, life lessons, restaurants, service, tipping. Bookmark the permalink.